Improvements to America’s aging transportation infrastructure are lagging behind the growing needs and numbers of inbound tourists, but government lobbying by the U.S. Travel Association (USTA) continues to prioritize the improvement agenda. “More dialogue is needed with this current administration, but these efforts take time so we are pushing now,” said Roger Dow, president of the USTA. 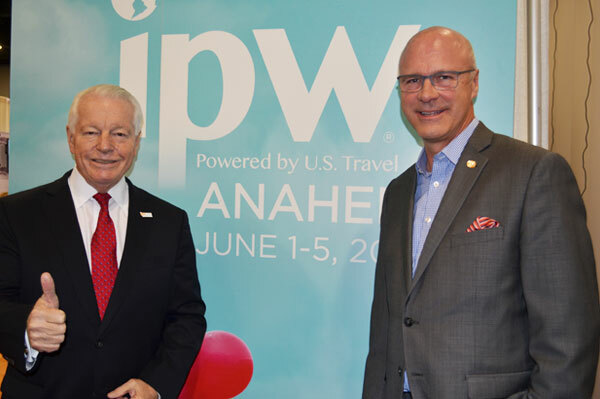 Dow made his comments to a large assembly of international and domestic journalists during the recent IPW 2018 travel trade conference in Denver last week. “Twenty-five years ago, most of the top 20 airports in the world were in the US. Now, none of them have that ranking,” lamented Dow. He added the challenges to implementing improvements to airports are numerous, including how to raise the necessary funding and how to expand airports without impacting the surrounding citizens who live nearby. “Look how long it is taking Heathrow to approve a new runway,” said Dow, referring to the London airport as a comparative situation. Dow contemplated future scenarios for US inbound tourism, based on a predicted increase from 76 million visitors per year currently to 100 million per year by 2021. That kind of growth will add about 5,000 passengers per day to JFK in New York and 4,000 per day to LAX in Los Angeles, he said. “How are we going to deal with this? We will struggle to manage this kind of growth at our airports in the future if there are no improvements,” he said. Dow devoted part of his presentation to the schedule outlook for IPW over the next few years. The travel trade conference is set to take place in Anaheim in 2019, from June 1-5. It will move to Las Vegas in 2020, then Chicago in 2021 and Orlando in 2022. Pictured, Dow (l) with Jay Burress, president and CEO of Visit Anaheim.